when all of those synapses have been connected somewhere along the way, when all of that cozy-cottage DNA courses through your chromosomes, well, you don’t look for a place to lay your head quite like the rest of the world. you don’t get wowed by granite countertops or showers that look as if they might lift off and whirl to outer space. nope, you tend to poke around in peculiar uncharted ways. you know when you’re home when you hear the ping go off somewhere deep inside your noggin. you wait to feel the pounding there in your chest. matter of fact, you must have a light meter tucked back behind your eyeballs, because you always, always pay attention to the way the sunbeams filter in through the windowpanes. you become over the years a decidedly undeniably nesty girl. you turn into a someone who draws oxygen from dappled light dancing on old floor boards, who finds herself charmed by the newel post at the bend in the staircase, who spies clawed feet peeking out from under the victorian bathtub and you can’t wait to climb in. you, very much so, find places to live by heart. and you are over the moon when along with all of those lumber and glass particulars, you discover the person who owns the place is clearly a kindred spirit, a brand-new lifelong friend, the soulmate you’ve been searching for, without ever asking. and so it was that we stumbled upon a charmed treetop aerie the other afternoon, one that will be our home for a year, the holy sacred place we’ll come back to night after night, as soon as we launch our big back-to-college adventure in cambridge, massachusetts, 02139.
as much as, just a few weeks ago, i could barely imagine leaving this old house that owns a piece of my soul, i discovered this week what i’ve always known: four walls and a roof are only the beginning. what makes a place home are the whispers you hear when you tiptoe in through the doorway. what makes a place home is the way some invisible hand reaches out and cradles the tenderest parts of you. and as we motored about the twisty winding streets of old cambridge, i knew, soon as we turned around the corner of putnam and franklin, that suddenly something felt familiar, not foreign, even though i’d never been there before. maybe it was the pie bakery & cafe we passed just before taking a left turn at the white picket fence. maybe it was the cobblestone sidewalks. or the victorian laciness of the woodwork out front. as soon as the front door opened, and a gentle man ushered us in, as soon as we passed the statue of st. jude tucked in one of the bends in the three-story staircase, i found myself sighing deep down inside. once we walked in, once i saw the way the sunlight fluttered on the old floor boards, dancing through the leaves of the trees that harbored most of the many, many windows, once i noticed the old brick column, a chimney from the downstairs fireplace, once i saw the cherry dining table with room for all of us and a few of our friends, i was starting to cross all my fingers and toes. then, i tiptoed into the book-lined office of the very kind man who had opened the door, who had shaken our hands and left us alone to look about in quiet. i spied there on his desk the covers of books with titles that gave me goosebumps, each one some combination of poetry and divinity, the two subjects i’ve long said i was heading east to study. i felt tears welling up in my eyes. i hadn’t expected any of this. i’d more or less abandoned the hope that my long string of real-estate magic could take yet another miraculous turn. real estate, they tell you, is all about hard cold numbers: dollar signs and square feet. it’s about making the deal, signing the contracts. except when it’s not. except when you’re a soulful spirit and you don’t work in worldly ways. you wait for the tears to spring in your eyes. you wait to feel that thumping thing there in your chest. you don’t need dotted lines, on which to scribble your name. you don’t need security deposits to promise you will keep from banging holes in the walls. you, an A-number-1 nesty girl, you know when you’ve stepped into a hallowed chamber. you didn’t need all the running around to the bank and the notary public. all you needed was to stand there and shake hands, a deal is a deal — when it’s of the heart, that is. you didn’t need some 10-page typed contract. you simply accepted the invitation of the lovely fellow and his lovely wife to come back that evening for a glass of wine at the candlelit table on the back deck where the mockingbird kept up his night song, and all of you began the unspooling of your life’s story, and the very first threads that would stitch you together for years to come. and so it is that we now know where we’ll hang our hearts this coming school year, when all of us go back to school in cambridge. and so it is that once again i am witness to the truth that if you never extinguish the pilot light of faith in undying old-fashioned goodness, it will up and surprise you, surround you, and illuminate your path in pure unfiltered luminescence. and that’s how nesty girls do real estate. 2 bdrm, 1 w/ skylight where you can absorb the lullaby of gentle summer’s rain. kitchen w/ bird feeders at 2 windows. windowseat tucked into corner. back deck tucked into the tops of trees, looking out on a flock of gabled roofs where mockingbirds and robins perch for evening song. bookshelves stocked with every cookbook you could dream of. complete, chronologically-catalogued case of sacred music. old quilts on beds. hardwood floors that glow in sunlight. birdsong from 4 a.m. till sunset. church bells, 2 blks. away, chime on the hour. herb garden. climbing roses. lifelong friendship included. floorboards and ceiling beams appear to have absorbed years of poetry. how would you write the real estate ad for the place you call home? the courage to come back. one last time. i went back to my old hospital, children’s memorial in chicago, on a sunny sunday afternoon this past weekend, for what was billed as a “closing ceremony” for families who had had a child die there. the old hospital is coming down soon, and before its nine stories are crumbled to a pile of shattered bricks and twisted rebar, the hospital’s biggest hearts and best minds understood that those families needed a chance to say goodbye to a cornerstone of their life story, no matter how dark the chapter. it was a story and a moment i had to honor. as a nurse i was there for my beloved troupe of kids, the ones who died on my watch: julie joiner, a girl i loved, a girl who had cancer in her spine, and who, lying flat in her hospital bed, once made me a papier-mache pumpkin head and painted it green. she called me her “irish pumpkin queen.” and did i mention i loved her dearly, still think of her, still remember the gift it was to be her nurse? i was there, too, for joe, and for pebbles, and for jeffery, and for denise, and even for the kids i loved whose names i don’t remember. i was there for their mothers and fathers, who allowed me to care for and to love their children, straight through to their dying breaths. i was there as a writer, too, because over all these years i have learned that words are the finest instruments i can reach for as i carry on my nurse’s promise: to shed light where there is darkness, to hold up the human spirit, and to aim to heal through whatever form love flows. here is the story i wrote. even though it won’t run through printer’s ink in any newspaper, sharing it here is rich enough for me. Most of all, it took courage. Even before they got there, it took courage to scribble the date and the time and the event — Closing Reception for Bereaved Families — onto the calendar. It took courage to get on the plane in New York or Arizona, or to climb in the car or the pickup truck in Iowa or Highland Park or Tinley Park, and head back to the corner of Lincoln and Fullerton and Halsted streets in Chicago, where for 130 years, Children’s Memorial Hospital has stood, a brick-and-mortar reminder to everyone who walked or drove by that it is not to be taken for granted that children are full-cheeked, and blessed with mops of hair, and can romp in the sunshine. To go back there, to go back to the place where you heard your child’s last breath, where you held that child in your arms one last time, or kissed him or her on the forehead, or where you crumpled over their lifeless body, is to open a deep dark vault of pain and emptiness that never goes away. And so, once there at that unforgotten place, you could see the courage it took just to push the “8” button on the elevator of the parking garage, to get to the rooftop on a sun-soaked Sunday afternoon domed by a blue sky pocked with puffy clouds. You could see it in the faces of the mothers who looked as if they held back a seawall of grief. You could see it in the way a grown son wrapped his arm tight around his mother’s shoulders as they strolled down Lincoln Avenue and turned in at the parking garage, or the way a father clenched the hand of his wife, and leaned hard against the glass. You could see it as the mother in big dark sunglasses squeezed her grown daughter’s hand so tight her knuckles blanched white. For the 350 or so mothers and fathers and brothers and sisters, grandparents, aunts and uncles, all from families who had had a child — a newborn, a toddler, or a highschooler — die at Children’s, it took a rare brand of courage to come back, one last time, to whisper yet another goodbye. This time, though, the goodbye was to the building that, for many, had been etched into their darkest memories — the floorplan all but memorized, the steps from the nurses’ station to the door of the room still known by heart, the view out the window frozen in their mind’s eye. Even the nubby fabric of the seats in the chapel, those are the details of a dying and death that are never forgotten. And so, some 2,000 invitations were mailed back in March to each family whose child had died there in the last 12 years. Through word of mouth, even the family of a girl who died in 1932 responded. Every day for weeks, James said, dozens of those families have called, just to retell their story, just to make sure all wasn’t lost. Because until moving day — Saturday, June 9, when the Ann & Robert H. Lurie Children’s Hospital of Chicago officially opens — the Lincoln Park hospital was still treating children on its medical and surgical floors, in its intensive care units and emergency rooms, the “closing ceremony” was held on the rooftop of the parking garage across the street, looking onto the concrete-and-blue-tile tower, just below the helicopter pad where the sickest and most critically injured children have been airlifted over the decades. Purple tulips and blue hydrangea, tucked into silver cups, teetered on tabletops in the afternoon’s wind. Chimes clanged. And the elevator doors began to open and close, ferrying the somber families. “It’s like I can play everything back,” she said, as she began to pull story after story from her memory. She hadn’t been sure she’d be able to make the trip back to Children’s, she said, but her husband urged her, and her sister and brother-in-law met her there. “Our tears are our trophies,” said the brother-in-law, Jack Segal, as he wiped one off his cheek. Not far away, another mother, standing in line for a cup of water, didn’t even try to brush away her tears. “Why come? I had to come. How could you not come?” said Barbara Pinzur, whose son, Brett, was just five days old when he died in the neonatal intensive care unit, back on May 22, 1994. He had been born with three, not four, chambers in his heart, and just the week before the closing ceremony, Pinzur, of Highland Park, said she opened his baby box. She pulled from her purse the card the NICU nurses had sent after Brett died. And so, after the reciting of the children’s names, and the tinkling of chimes, and the reading of a poem or two, the mournful bagpipes of the Emerald Society shattered the near silence of the rooftop crowd. One by one, the mothers and fathers and brothers and sisters and grandparents, aunts and uncles and friends, dipped itty-bitty wands into vials of bubbles, and exhaled. A cloud of iridescent spheres up and wafted across the rooftop, out over Lincoln Avenue, and toward the place where so many children have died. At last, a smattering of smiles broke across the sea of somber faces. One of the mothers ran to the rooftop’s concrete half-wall, pulled out a camera and tried to capture one last snapshot. And just as the camera clicked, the bubble exploded and was no longer. 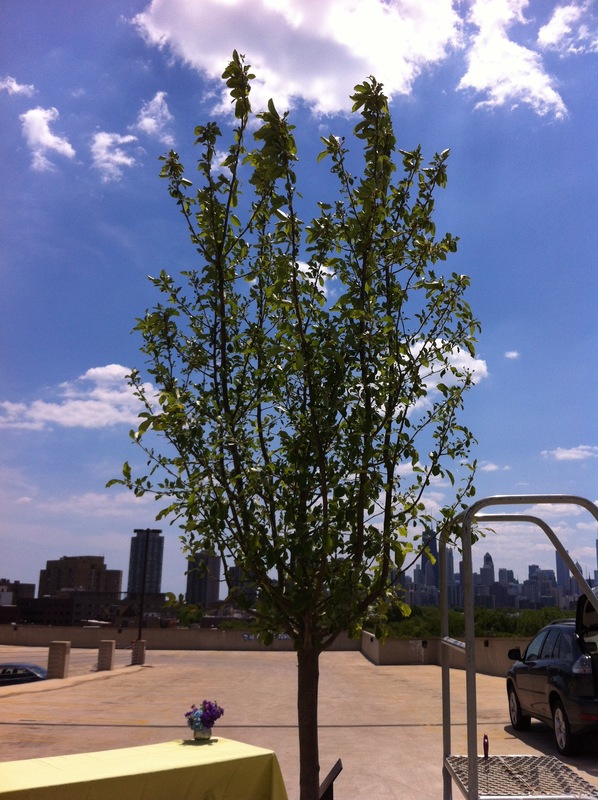 the photo above was taken on the hospital’s parking garage rooftop, and the magnificent city skyline is the backdrop to a red jewel crabtree that will be planted in a park across from the old hospital’s site. families were invited to fill out a tag with a name or a memory, and hang it from the branches. when the tree is planted, the tags will be buried at its roots, so that the families always have someplace, some sacred place, to come back to. in all the years that we’ve been pulling up chairs, it’s become more than cloudy clear, i’m certain, that i tend to be a nesty girl, a girl who sinks her roots down deep, and doesn’t yank them lightly. so bear with me while i tell you the tale of why it is i am apartment hunting nowadays, and what in the world three-dot plates have to do with that far-flung adventure. but let’s begin at the beginning, where most stories do begin, and turn the clock back to a dark december day. there i was sitting at my typing pad in the newspaper tower, when i heard a ping ring out from the box that was my desk-top computer. i clicked and looked and saw there a missive from my lawful wedded mate. seems he’d gotten a little email from some folks at a university in cambridge, massachusetts. they were asking him to apply for a fellowship, a journalism fellowship, one that gathers 24 fellows from around the globe, and one that would entail a one-year stint, thus lifting our whole little family out of our cozy chicago life and plopping us onto an unmapped one in cambridge. kind fellow, decent fellow, my mate, he wrote back right away to say that he was deeply flattered but no thanks; we have a little fellow, a fifth-grade fellow, he explained, who could not be yanked from his life. as a mere afterthought, this man i married, he sent this all along to me so i could smile and carry on with my otherwise ordinary day. or at least that’s what he thought i’d do. i shot right back, “whoa, hold your horses there, buster. at least stop and think about it,” i implored. “is this not the manna from heaven that we’ve been praying for? peering skyward day after day, in search of sign of falling crumb? “let’s at least ask the little guy, see what he has to say,” i begged, all but dropping to my knees. 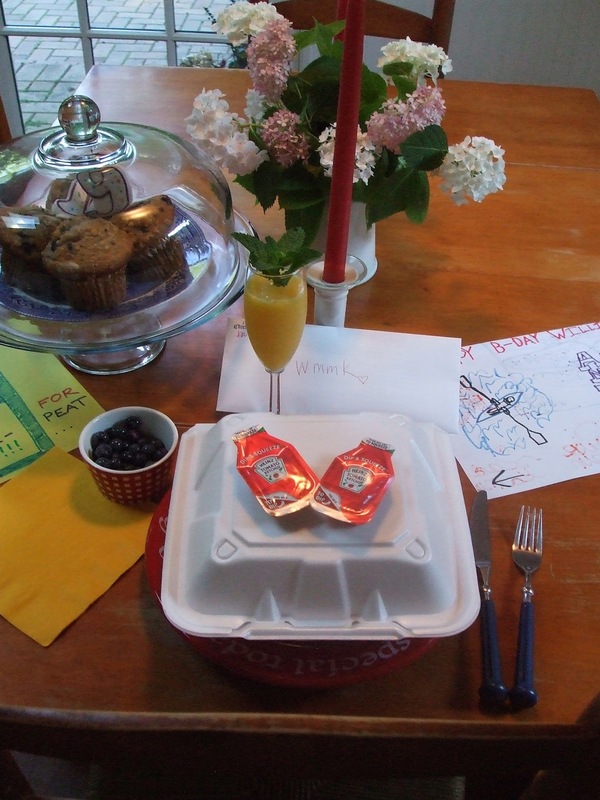 and so we did: that night at dinner, we asked the 10-year-old lad what he’d think about moving away for just one year, moving, say, to massachusetts, so daddy and mommy might go back to college? we explained every which way that this would mean he would not be here for sixth grade, nor for soccer on the team he loves, nor for spring baseball, nor friday night skate, his highlight of so many weeks. no matter what we pitched his way, he batted it all away, stood fast to his determination that it was time to see the world. so, as i scrubbed the dirty plates that night, it was my turn to come up with excuses why we shouldn’t leave. 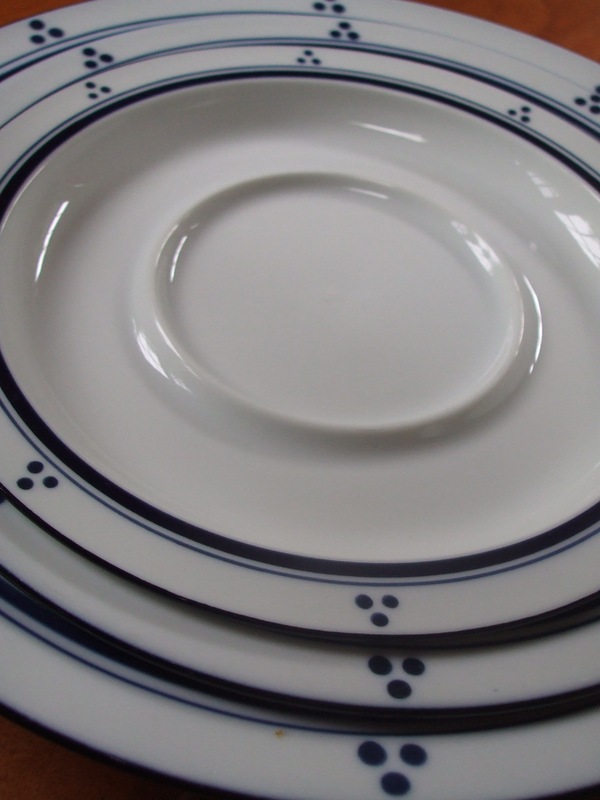 i wasted no time ticking off a long list of things i could not bear to leave behind: my three-dot plates, for instance. i’ve only four sets, and only scored them after tracking them down at a resale shop, after pining for them for 20 years. they’d been the plates i wanted back when we were getting married, but the architecture critic who would be my mate thought the dots got in the way. in the way of what, i’ve never quite determined. but the dotted plates went the way of the rose-covered bedsheets i’d once admired. one makes compromise when living with a design-steeped fellow, and i long ago realized our peaceful co-existence depended on my occasional surrender to his whims. so these plates, procured a full two decades post betrothal, they are the plates i pluck from the stack whene’er i need a ceramic boost. and somehow, in that odd way my mind stumbles along, they came to represent the dividing line between the world i’d leave behind, and the one i just might dive into. what if they were cracked and broken while we were away? what if, whilst i was off in pilgrim land, they were accidentally expunged from the cupboard, and, upon return, i’d find myself without the proper spotted saucer to uphold my breakfast toast? for more than a day or two, i weighed the choices here: go to harvard, play like a pig in mud, taking any class i could stuff into my braincells; or stay here in chicago, in the house i know and love, and eat off three-dot plates till the end of time. in due time, i realized i was, frankly, an idiot to be debating such obstacles. i surrendered to the adventure of it all, and cannot over-emphasize how that deep-down sense of grab-it-now-it-might-not-come-again has come to permeate, well, just about everything. ever since, i’ve been living my days as if each one is a bit of a hallelujah christmas gift, a box wrapped up in shiny paper, with pretty bow and all. it was, in fact, the rocket-booster oomph behind my thinking it was time to leave behind the newspaper life i had long loved. and right in here, with may and june and summertime swirling deliciously around us, it’s what propels me not to mind spending hours at the kitchen table, or perched on chairs outside, in the dappled light of the pine trees, chewing over a thousand ideas and stories with my college boy, now home for endless days and nights of sweetest-ever summer. we had no idea, of course, whether embracing the adventure would lead to any sort of happy ending. had no idea, once the long and layered application was turned in, shipped off cambridge way, whether the deciding folks would pick the home-team architecture critic, slot him in the nieman class of journalism fellows for the school year 2012-2013. but, indeed, they did. he is the arts and culture fellow. so here we are. poring over real estate ads, dialing up massachusetts realtors, searching high and low for a two-bedroom apartment in ZIP code 02138 or 02139. and before we’ve found a place to lay our sleepy heads, we’ve taken care of business and secured a slot on a cambridge soccer team for our little goalie. priorities, after all. as for this old house we love, we have a beloved friend who will move in, hold down the fort here, watch over the three-dot plates, and the red-and-white checked chair, and the window seat i’ll miss. and for one extraordinary year, i’ve come to deeply realize, i will make a new nest. i will come to know the rhythms of a new city, an extraordinary city, a city where i have always, always wanted to live. i will sit in classrooms, and stuff my brain with poetry and writing and divinity, and some of america’s great professors. i will tiptoe into the widener library, and deep breathe. i will walk home down cobbled streets, absorb the cacophony of a learned city. and a week from today, we will board a plane, all four of us in our little adventure troupe, and we will pound the sidewalks, ring doorbells, and peek in cupboards and bathrooms till we find the place that we’ll call home for the next sweet year. and maybe while away in far-off cambridge, i will stumble into yet another thrift shop, and lying there in stacks, i’ll spy a three-dot plate. 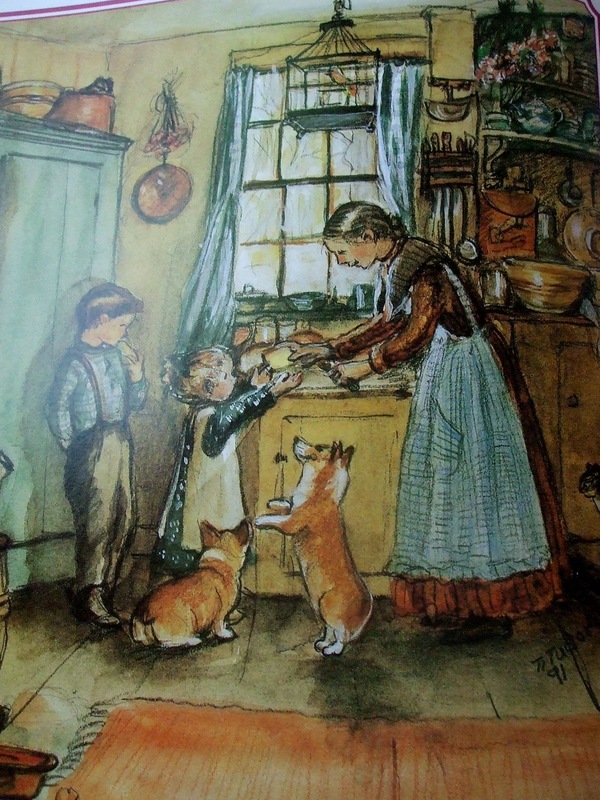 and i will know, through and through, that home is wherever you set the table. pull up a chair. and share your heartfelt stories. so that’s the news of the week, and, fear not, you’ll all amble along with us on this fine adventure, as the chair will go on, and i’ll impart every week the finest things i’ve learned in all my college lecture halls. congratulations, we’re all going back to college. p.s. next week’s trek is merely the apartment-hunting expedition. we don’t pack the wagons and head east till round about early august….